Eels are members of the Muraenidae family, which contains approximately 15 genera and 0ver 200 species. Eels are a commonly kept group of fishes due to their unique looks, interesting behavior and general ease of care. 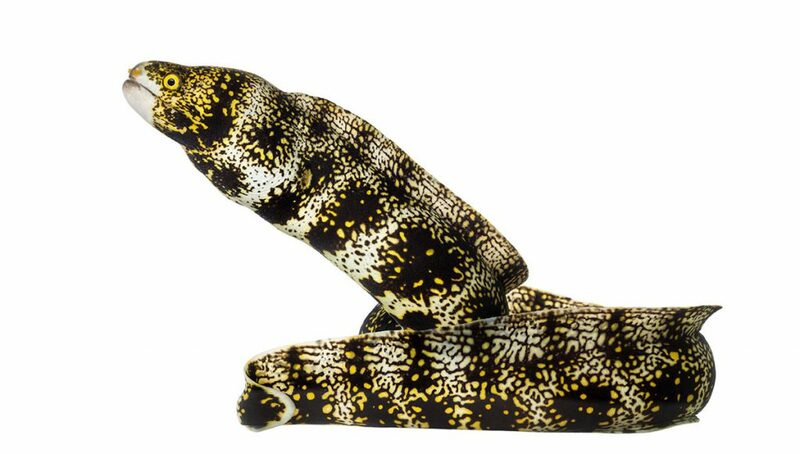 The Snowflake Moray Eel (Echidna nebulosa) is one of the most commonly sold eel species. Other eel species commonly seen in the aquarium trade include the Chainlink Moray (Echidna catenate), Jeweled Moray (Muraena lentiginosa) and Whitemouth Moray (Gymnothorax Meleagris). Moray eels are found in all the world’s oceans. They can range in length from 4“ (11 cm) to 13’ (4 m), though most species available in the aquarium trade are much more moderate in length. Moray eels are cave dwellers, who rely heavily on their sense of smell for hunting down prey. They are known to consume octopus, squid, large crustaceans and fish. Eels make great aquarium inhabitants, provided their husbandry needs such as diet, water quality and tank space are met. It is important to remember that moray eels are predatory in nature, and they may consume other aquarium inhabitants. Eels are also known as escape artists, so a tight-fitting lid it paramount to maintaining these fish in captivity. Most eels prefer a temperature range of 72F (22C) to 80F (26C). Eels can be considered a reef safe fish, as they will not harm or consume corals, however they are likely to consume some ornamental invertebrates as well as fish. It is important to consider carefully what species of eel may be best for your aquarium. While smaller species such as the Golden Dwarf Moray (Gymnothorax melatremus) are suited to tanks as small as 20 gallons, larger species such as the Green Moray (Gymnothorax funebris) may be better suited to a larger tank. We suggest a diet based on Piscine Energetics Frozen Mysis.